What I did: I was the co-creator of the project, serving as its director, lead producer/designer, level designer, co-writer, lighting artist, and scripter. I also did budget, hiring, business negotiations. All told, I did almost everything besides programming and art. WHAT IS the myth machine? The Myth Machine is a "tech-gothic" immersive mystery set in a near-future world of crumbling start-ups. Inspired by speculative sci-fi like Black Mirror, The Myth Machine confronts the dark side of modern technology and tech start-up culture. A few years from now the American Dream is finally dead. The great digital golden age, when nerds were gods of industry - forging the internet, building robots, creating the future itself - was its last gasp. The offices are empty: bought out, liquidated, or simply left to rot. In this world the only steady job -- your job -- is to sift through the leftovers. You are Mila, a broke college grad from an immigrant family trying to make a living. Your client wants you to inventory an old eccentric office space in search of some high-value tech. But what begins as a typical corporate salvage job becomes a descent into a century of illegal government research: mind manipulation, identity reconstruction, all to protect citizens against foreign influence. It gets inside your head and begins to drive you mad. Or is it setting you free? To find out, you must come face-to-face with The Myth Machine. I initiated this project with my partner Clara Fernandez-Vara, who remains the co-creator, co-writer, and adviser on all aspects of the project. In the day-to-day, I serve as the creative lead and core vision holder, doing everything besides programming, art, and some of the writing. I designed the initial concept for all the core mechanics, level design, and story on paper. That includes not only the scavenging mechanic, the conversation system, and psychological systems, but also the backstories on all core characters as well as how the plot unfolds during play. I developed our greybox prototype in Unity 3D, doing temp art and scripting to get the basic game framework up and running. 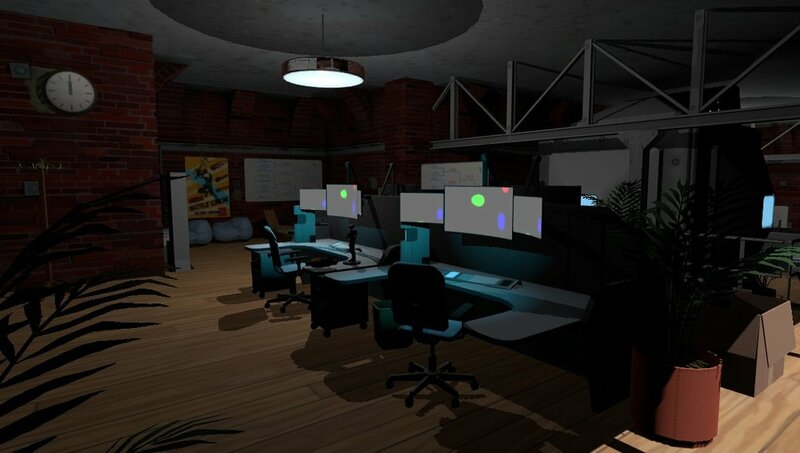 I designed and build the entire game space -- the first few floors of the abandoned office -- and built the player movement system to make them explorable. With the help of contractors and collaborators, I oversaw the creation and implementation of the deeper mechanical systems (scavenging, conversation, etc. ), the 3D environmental art, and our interactive music system. In parallel with this, I built and re-built the space as we went, refining the experience into what Clara and I's vision specified. Clara and I wrote the game text, dialogue, and directed the voice actors.